2. Rub in margarine or lard until the mixture is like fine bread crumbs. 3. Add the sugar and the egg if used. 4. 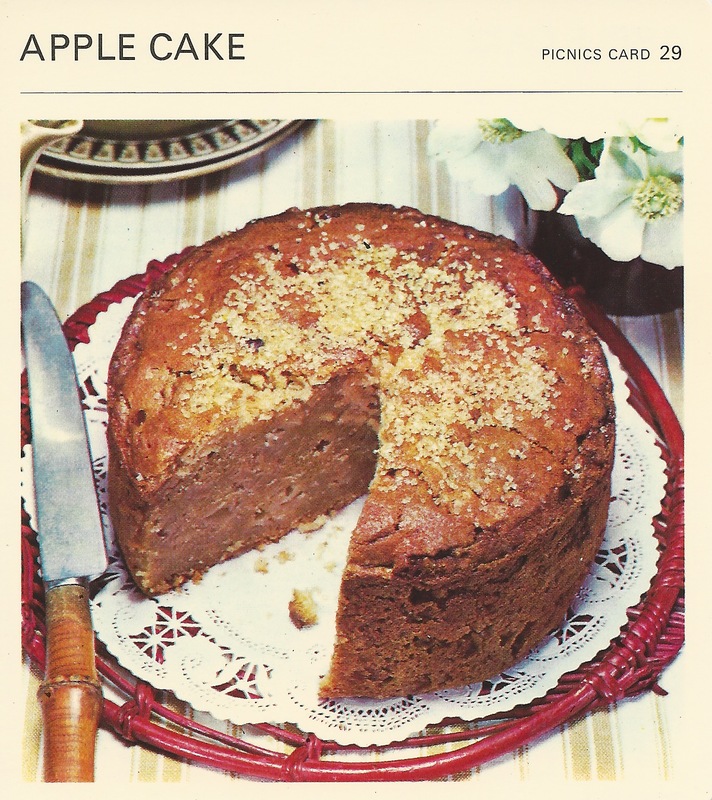 Peel the apples, cut into neat dice, add to the cake, and mix well. 5. Stir in enough milk to give a slow dropping consistency, i.e. the spoon needs a hard shake before mixture drops back into the bowl. 6. Put into the greased pan. 7. Bake for 1 hour at 375-400°F or until firm to the touch; if the outside is browning too much reduce the heat slightly. 8. Turn out carefully, top with sugar. TO SERVE: This is an ideal cake for a picnic for it carries well. It is not over sweet and it has a moist texture. TO VARY: Add a little spice and currants. TO STORE: Should be eaten fresh. ← Lookit! I’m A Pieathlete! Hi I have misplaced this card out of my collection for the apple cake do you have a way I can purchase the one card to add back to my collection. Hi- I don’t sell cards. This is just a fun hobby from my own collection. You might be able to find a replacement through Etsy or Ebay.